The Battle of Tannenberg Line (German: Die Schlacht um die Tannenbergstellung; Estonian: Sinimägede lahing; Russian: Битва за линию «Танненберг») was a military engagement between the German Army Detachment "Narwa" and the Soviet Leningrad Front. They fought for the strategically important Narva Isthmus from 25 July-10 August 1944. The battle was fought on the Eastern Front during World War II. The strategic aim of the Soviet Estonian Operation was to reoccupy Estonia as a favorable base for the invasions of Finland and East Prussia. 24 volunteer infantry battalions from Denmark, East Prussia, Flanders, the Netherlands, Norway, and Wallonia participated within the Waffen-SS. Roughly half of the infantry consisted of local Estonian conscripts motivated to regain Estonian independence rather than support Nazi power. The German force of 22,250 men held off 136,830 Soviet troops. As the Soviet forces were constantly reinforced, the casualties were 170,000 dead and wounded, and 157–164 tanks. The formations of Gruppenführer Felix Steiner's III SS (Germanic) Panzer Corps halted their withdrawal and moved into defensive positions on the hills. The 4th SS Volunteer Panzergrenadier Brigade Nederland started digging in on the left (north) flank of the Tannenberg Line, units of the 20th Waffen Grenadier Division of the SS (1st Estonian) in the centre, and the 11th SS Volunteer Panzergrenadier Division Nordland on the right (south) flank. Another front section manned by the East Prussians of the 11th Infantry Division was situated a few kilometres further south, against the 8th Army in the Krivasoo bridgehead. On 26 July, pursuing the withdrawing Germans, the Soviet attack fell onto the Tannenberg Line before the vastly outnumbered Army Detachment "Narwa" had dug in. The Soviet Air Force and artillery covered the German positions with bombs and shells, destroying most of the forest on the hills. The headquarters of the newly arrived Flemish 6th SS Volunteer Sturmbrigade Langemarck were destroyed and almost all of their officers wounded. Sturmbannführer Wilhelm Rehmann left the battlefield, as Leutnant George D'Haese stepped in to bring the brigade back to combat readiness. The German batteries were badly hit; the commander of one of them had been killed. It took a few days for Steiner to repair the assault guns and, until this had been completed, the impact of the German artillery remained modest. Benefiting from the disorder, the Soviet 201st and 256th Rifle Divisions supported by the 98th Tank Regiment assaulted the positions of the "Nordland" Division, seizing the eastern side of the Orphanage Hill. In the darkness of the following night, the Anti-Tank Company SS Panzergrenadier Regiment 24 "Danmark" destroyed the Soviet tanks and regained their positions. In the morning of 27 July the Soviet forces opened up another powerful artillery barrage on the Sinimäed. Anticipating an infantry attack, Steiner concentrated his few working armored vehicles, consisting of seven tanks under the command of Obersturmbannführer Paul Albert Kausch. Steiner placed them behind the westernmost Tower Hill in readiness positions. A company of Nebelwerfer rocket launchers were placed behind them, which were able to fire 48 projectiles within a few seconds. Units of the "Nordland" Division were placed between the two hills and the defense was completed by the Anti-Tank Company, 1st Estonian behind the "Nordland". The Soviet attack concentrated at the Orphpanage Hill and the Danmark Regiment south of it. The Danish anti-tank company used their Panzerfausts to set 14 tanks on fire. Meanwhile, the Soviet infantry forced the weakened "Langemarck" Sturmbrigade to leave the south side of the Orphanage Hill and dig new trenches in front of the Grenadier Hill. As a last resort, Unterscharführer Remi Schrijnen used the only heavy weapon left in the sturmbrigade, a 7.5 cm PaK 40 anti-tank gun. Schrijnen was wounded and cut off from the rest of his troops when he started acting as both the loader and gunner. He and the Flemish heavy machine-gunners halted several Soviet tank attacks threatening to encircle the "Langemarck" and the Estonian battalions. The Soviet attack also failed to penetrate the defense line of the II.Battalion, SS Volunteer Panzergrenadier Regiment 49 "De Ruyter". Several Soviet tanks broke through to the headquarters of the battalion, but were repulsed by Gruppenführer Fritz von Scholz Edler von Rerancze, sending 12 assault guns forward from the reserve. South from the Orphanage Hill, the Soviet forces broke through the defense of the "Danmark" Regiment and seized control of most of the hill by nightfall. On the night before 28 July the SS Reconnaissance Battalion 11, "Nordland" and the I. Batallion, Waffen Grenadier Regiment 47 (3rd Estonian), launched a ferocious counterattack. Heavy casualties were inflicted on both sides—the Estonian battalion was destroyed. The fighting for the Orphanage Hill was carried on to 28 July as one continuous battle. The II Battalion, "Nordland" launched a fierce attempt to capture the Orphanage Hill, which the Soviets repulsed. 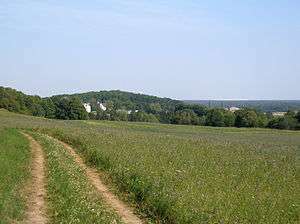 The surviving German forces fell back to the Grenadier Hill. For the next day the 2nd Shock Army was reinforced with the 31st and the 82nd Tank Regiments, three howitzer brigades and nine heavy artillery regiments. On the morning of 28 July Soviet forces made a ferocious attempt to outflank the German forces resisting at the Orphanage Hill from the north side. When the last anti-tank gun of the "Langemarck" destroyed the Soviet armored force, the Soviets were denied a breakthrough. They suffered heavy casualties, but ordered an air and artillery assault aimed at destroying the withdrawing German units. Anticipating the attack, the German troops advanced into no-man's-land close to the Soviet units instead. In close combat, a Flemish regiment of the "Langemarck" repulsed the Soviets, which brought it to near destruction. In the evening of 28 July German forces attempted to regain the Orphanage Hill again. Using the tactics of "rolling" small units into the Soviet positions, the troops seized the trenches on the slope of the feature. When a Soviet tank squadron arrived, the German attack collapsed. At a point occupied by the German 11th Infantry Division near the borough of Sirgala in the south, the Soviet tanks aimed to break through. Steiner ordered a withdrawal to a new defensive line at the Grenadier Hill. The order did not reach a significant part of the German forces, which remained in their positions at the Orphanage Hill. Anticipating a major attack, Steiner ordered the heavy weapons of the SS-Panzergrenadier Regiment 23 "Norge" and the "Danmark" Regiment to be pulled together into two shock units. By the night of 28 July the battle had subsided. The attack of 6,000 Soviet infantry began at 0900, supported by a regiment of nearly 100 tanks (most of them of the heavy IS-2 variety). They used their 122 mm guns to fire directly at the strongpoints showing any signs of life and destroyed the remaining bunkers. The remnants of the German advance guard were destroyed. The platoon commanded by Lt. Lapshin broke through to the top of the Grenadier Hill. Special courage was shown by Sgt. Efendiyev, who destroyed a German strongpoint on the hill. The Komsomol organiser, V.I. Lavreshin of the 937th Rifle Regiment, who had been marching ahead of his troops with a red flag in his hands, erected it at the summit. The small German units who still resisted were paid no special attention by the Soviets, as the main attack was carried westwards. The principle of the Soviet attack in the Sinimäed was an overwhelming frontal shock, with only a few of the attackers presumed to have reached the target. With artillery fire preventing reinforcements being sent in from the German rear, the Soviet 8th Army went on the attack and drove a wedge into the north flank of the 11th Infantry Division. The Soviet main tactical goal, the Grenadier Hill, was to be assaulted by the 6,000 troops of the 109th Rifle Corps. The 109th Rifle Division attacked the "Nederland", which was covering the hill from the north. The 120th Rifle Division hit the Grenadier Hill from the east. The 72nd Rifle Division assaulted the II Battalion, 3rd Estonian Regiment, which was defending the northern flank. The 117th Rifle Corps stood ready to break through the last of the German defenses. The Orphanage Hill fell to the Soviets with the 191st Rifle Regiment at the head of the attack. This unit suffered great casualties from the fire of the last defenders who in turn were either killed or forced to the Grenadier Hill. With the seizure of the Orphanage Hill, the Soviet 201st and the 256th Rifle Divisions were exhausted, as the 109th Rifle Division continued to press towards the Grenadier Hill alone. The defenders were commanded by Josef Bachmeier, the head of the II Battalion, "Norge". The I. and II. Battalions, 3rd Estonian subordinated to Bachmeier had 20 to 30 men each. For the defense of the Grenadier Hill, every available Estonian was sent into battle, including communications personnel. The central command post was destroyed by Soviet fire while the Germans, Flemish, Norwegians and Estonians escaped destruction by lying down in their bunkers. Behind them at the summit of the Grenadier Hill stood the "Nederland". The gaps created in the attacking infantry and tank line by the German artillery did not stop the Soviet advance. The 109th Rifle Division passed the remnants of the II. Battalion "De Ruyter" which used its light machine guns to inflict heavy casualties upon the Soviets. The Soviet attack ran into the camouflaged anti-tank gun of Remi Schrijnen standing near the northeastern corner of the hill. Meeting the Soviet attack, he fired his gun, destroying seven tanks in the course of which he was severely wounded when his gun was destroyed by an IS-2 tank returning fire from 30 metres. Despite Schrijnen's heroics, the Soviet tanks besieged the Grenadier Hill and kept circling it, all the while firing away at the defenders. Nevertheless, they could not capture the summit due to heavy casualties caused by the German anti-tank guns and the anti-aircraft guns pointing their barrels down the slope. Other Soviet tanks reached the westernmost hill Tower Hill. The defenders in their bunkers, which were poorly fortified from the north and the flanks, were destroyed. Among the Soviet tank commanders, starshina S.F. Smirnov destroyed five German strongpoints. One of the tanks reached the community center of the municipality of Vaivara, blasting a hole in the wall. This remained the westernmost point the Soviet armed forces reached in Northeast Estonia until late September 1944. 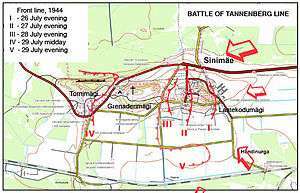 By noon on 29 July Soviet forces had almost seized control of the Tannenberg Line. During the attack they had suffered heavy casualties and were unable to secure their positions at the Sinimäed Hills. A mortally wounded German radio operator cleared the eastern slope of the Grenadier Hill by waiting for the Soviet troops to reach his position and then ordering an artillery barrage on himself as the Soviets surrounded him. The Soviet tanks threatened the headquarters of the "De Ruyter" Regiment. The counterattack by the headquarters guards company was repelled and Obersturmbannführer Hans Collani, seeing a Soviet tank from his headquarters doorstep, shot himself dead. His observations turned out to be erroneous, as Steiner ordered the last German tanks out from the reserve (they were commanded by Paul-Albert Kausch). He distributed his tanks in three units. One of them went on to counterattack the Soviets besieging the Tower Hill; the second secured the Narva–Tallinn Highway in the west and the third unit counterattacked between the Grenadier Hill and the railway a few kilometers to the south. The arrival of the German tanks came unexpectedly for the Soviet armor. Probably being out of ammunition, the Soviet tank squadron retreated and the counterattack of the "De Ruyter" forced the Soviets from the Tower Hill. After the counterattack, only one German Panther tank remained unscathed. After the German counterattack the tactical situation at the Tannenberg Line remained unclear. The remains of the II. Battalion "Norge" at the Grenadier Hill assaulted the Soviets. The latter suffered heavy losses but regrouped and cut the Norwegians off at the east side of the hill. On the western terrace of the Grenadier Hill, Kampfgruppe Bachmeier and the III. Battalion, 3rd Estonian kept resisting. The Soviets started searching the bunkers for documents and prisoners. Steiner ordered an air assault using dive bombers from Tallinn Airport. The Soviets had anticipated the attack and had moved their self-propelled anti-aircraft units to the Orphanage Hill. They shot down several German bombers and afterwards turned their fire on the German infantry. Steiner had one more battalion to spare—the I.Battalion, 'Waffen Grenadier Regiment der SS 45 "Estland" (1st Estonian) which had been spared from the previous counterattacks because of the scarcity of able-bodied men. Sturmbannführer Paul Maitla requested reinforcements from the men in the field hospital. Twenty less injured men responded, joining the remains of the other destroyed units, including a unit of the Kriegsmarine (navy), and supported by the single remaining Panther tank. The counterattack started from the parish cemetery south of the Tower Hill, with the left flank of the assault clearing the hill of the Soviets. The attack continued towards the summit under heavy Soviet artillery and bomber attack, getting into close combat in the Soviet positions. The small German grenadier units were moved into the trenches. Running out of ammunition, the German troops used Soviet grenades and automatic weapons taken from the fallen. According to some veterans, it appeared that low-flying Soviet bombers were attempting to hit every individual German soldier jumping between craters, from time to time getting buried under the soil by the explosions of Soviet shells. The Soviets were forced to retreat from the Grenadier Hill. On 30 July the battle contionued in similar fashion. Soviet artillery increased the intensity of its fire to 30,000 shells, the German artillery answered with 10,000 rounds of its own. The subsequent attack by Soviet heavy tanks broke through the defenses of the II.Battalion, "De Ruyter" consisting of 35–45 capable men running between their heavy machine guns. Hauptsturmführer Helmut Scholz took units of the De Ruyter Regiment to the counterattack, destroying two tanks at the doorstep of Scholz's bunker and forcing the Soviets to retreat. For the battles of Tannenberg Line, Scholz earned the Knight's Cross with oak leaves, the only SS infantry company commander to do so. On 31 July the Soviet command changed the direction of its preparatory artillery fire, this time aiming it behind the hill and cutting off the German defenders from the main army group. The gradual decrease in the number of shells fired by the Soviet artillery (9,000 rounds on 30 July) was evidence of the weakening of the Soviet attacks. Soviet infantry started climbing up the Grenadier Hill. The Estonian units against them ran out of ammunition. Just in time, an improvised platoon of the "Danmark" arrived to rescue them, and another Soviet attack was repulsed. In the evening the Soviets tried yet another assault on the Grenadier Hill, but it was repelled by the unit commanded by Bachmeier, who was later decorated with the Knight's Cross. The remnants of the I. Battalion, 3rd Estonian resisted the Soviet attacks on the southern flank. The army detachment "Narwa" replaced its units with the less damaged detachments in the first days of August. Despite inflicting immense casualties on the Soviets, the Waffen-SS units were slowly getting worn down. The "Nederland" Brigade was reduced to the size of a regiment, while the two regiments of the "Langemarck" Sturmbrigade each had the strength of a reinforced company. The 2nd Estonian Regiment was virtually lost and the "Nordland" Division a shadow of its former self. To the German's good fortune, Soviet intelligence severely overestimated the strength of the defenders to more than 60 tanks and 800 pieces of artillery while in fact there were just one tank and 70–80 guns left at the Tannenberg Line. By 2 August, the 2nd Shock Army had re-deployed and assaulted, using the same tactics as previously. The men of the "Nederland" who survived the artillery bombardment, retreated down the slopes of the Grenadier Hill pursued by the Soviet units. In Steiner's memoirs, the intensity of the fire and the nature of the battles reminded him of the Battle of Verdun. When the artillery barrage ended, the freshly drafted II.Battalion, Waffen-Grenadier Regiment der SS 46 (2nd Estonian) returned fire after inflicting severe casualties on the assaulting Soviets and counterattacked, reclaiming the Grenadier Hill. Soviet tanks broke through in the southeastern section of the front as the Estonian assault team commanded by Hauptsturmführer Oskar Ruut, the 11th Infantry Division (consisting of personnel from East Prussia) and the 300th Special Purpose Division repelled them while suffering heavy casualties. On 3 August, the Soviets made a stronger attempt with the preparatory artillery fire of 25,000–30,000 shells reaching the level of the attack of 29 July. The fire caused heavy casualties, while a part of the defenders left their positions. Eleven Soviet rifle divisions and four tank regiments tried to spread their attack along the front. However, the main weight of the impending attack tended to be at the Grenadier Hill once more. The German artillery noticed the concentration of the Soviet forces, and launched their rocket fire, inflicting numerous casualties on the Soviet infantry and tanks before the beginning of the attack. As the German artillery fire did not dent the Soviet superiority in manpower, the Soviet attack began as scheduled. The 110th Rifle Corps assaulting the Grenadier Hill found themselves in the middle of cross-fire from the remnants of the I.Battalion, 2nd Estonian Regiment. As the commanders of the rifle corps erroneously reported to army headquarters on the capture of the Grenadier Hill, the artillery fire was lifted. The Estonians counterattacked and cleared the hill. Simultaneously, the 124th Rifle Corps attacking the southern segment of the front by the Vaivara parish church was repulsed. In the evening of 29 July, the army detachment "Narwa" counted 113–120 Soviet tanks destroyed, almost half of them in the battles of 29 July. The 2nd Shock Army reported on fifty of their tanks destroyed on 29 July. The German side counted an additional 44 Soviet tanks destroyed on 3–6 August. The German Army Group North buried 1,709 men in Estonia between 24 July and 10 August 1944. Added to the men missing in action, the number of irrecoverable casualties in the period is approximately 2,500. Accounting the standard ratio 1:4 of irrecoverable casualties to the wounded, the total number of German casualties in the Battle for Tannenberg Line is approximately 10,000 men. On 14 September, the Riga Offensive was launched by the Soviet 1st, 2nd and 3rd Baltic Fronts. It was aimed at capturing Riga and cutting off Army Group North in Courland, western Latvia. After much argument, Adolf Hitler finally agreed to allow the evacuation of all the troops in Estonia. After months of holding the line, the exhausted men of the III SS Panzer Corps joined the withdrawal; fighting their way back from the Tannenberg Line. On 17 September, the 3rd Baltic Front launched the Tallinn Offensive from the Emajõgi River Front joining Lake Peipus with Lake Võrtsjärv. The operation was aimed at encircling the army detachment "Narwa". Unable to hold the force, the German units withdrew towards the northwest while the incomplete II Army Corps was left to stall the Soviet attack. The "Narwa" withdrew quickly towards the Latvian border. On 22 September, Tallinn was abandoned. Some of the Estonian formations now began to attack the retreating Germans, attempting to secure supplies and weapons to continue a guerrilla war as the Forest Brothers against the Soviet occupation. Several troops of the Estonian Division stayed in Estonia. These units continued fighting, some survivors joining the guerrilla groups which fought the Soviet occupying forces until the end of the 1970s. 1 2 3 4 5 6 7 8 9 10 11 12 13 14 15 16 17 18 19 20 21 22 23 Toomas Hiio (2006). "Combat in Estonia in 1944". In Toomas Hiio; Meelis Maripuu; Indrek Paavle. Estonia 1940–1945: Reports of the Estonian International Commission for the Investigation of Crimes Against Humanity. Tallinn. pp. 1035–1094. 1 2 3 4 5 6 7 8 9 10 11 12 13 14 15 16 17 18 19 20 21 22 23 24 25 26 27 28 29 30 31 32 33 34 35 36 37 38 39 40 41 42 43 44 Mart Laar (2006). Sinimäed 1944: II maailmasõja lahingud Kirde-Eestis (Sinimäed 1944: Battles of World War II in Northeast Estonia) (in Estonian). Tallinn: Varrak. 1 2 R. Landwehr (1983). Lions of Flanders. Silver Spring: Bibliophile Legion Books. p. 143. ISBN 0-918184-04-5. ↑ R. Landwehr, T.H.Nielsen (1981). Nordic Warriors. Bibliophile Legion Books, Silver Spring. p. 105. 1 2 3 Wilhelm Tieke (2001). Tragedy of the faithful: a history of the III. (germanisches) SS-Panzer-Korps. Winnipeg: J.J.Fedorowicz. pp. 98–99. ↑ R. Landwehr (1981). Narva 1944: The Waffen SS and the Battle for Europe. Silver Spring, Maryland: Bibliophile Legion Books. p. 84. 1 2 3 4 5 6 7 R. Landwehr (1981). Narva 1944: The Waffen SS and the Battle for Europe. Silver Spring, Maryland: Bibliophile Legion Books. 1 2 3 4 5 6 Wilhelm Tieke (2001). Tragedy of the faithful: a history of the III. (germanisches) SS-Panzer-Korps. Winnipeg: J.J.Fedorowicz. ↑ Mart Laar (1992). War in the Woods: Estonia's Struggle for Survival, 1944-1956. Washington: The Compass Press. ISBN 0-929590-08-2. Carius, Otto. Tigers in the Mud. ISBN 0-921991-14-2. Michaelis, Rolf. Die 11. SS-Freiwilligen-Panzer-Grenadier-Division "Nordland". Tieke, Wilhelm. Tragedy of the Faithful: A History of III. (Germanisches) SS-Panzer-Korps.